The photo above was taken in 1985. 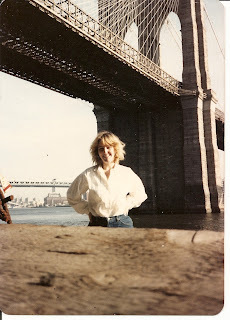 That's Sue on the Manhattan side of the Brooklyn Bridge before South Street Seaport came along and replaced the Fish Market. It was a gloriously deserted and somewhat dangerous place to hang out. The point I want to make is this- When I met Sue she was engaged, ring and all. But I wanted her- and in the only smart move I've ever made I pursued her. Today it would be called stalking I suppose. But I won. I have been really sick this week with stuff relating to my HLA B27- and Sue has taken care of me in every way possible. I never knew, or realized how much I am loved. Too busy thinking about the bad stuff in the past to be thankful for what I have in the here and now. So this is my public thank you to my partner in life. And Sue, I love you too.